A devout Catholic from Barangay Poblacion in Carcar City in Cebu has claimed that blood is flowing from a laminated image of Jesus Christ and Virgin Mary that appeared at about noon on Thursday, April 13. Residents flocked to witness the so-called miraculous phenomenon. 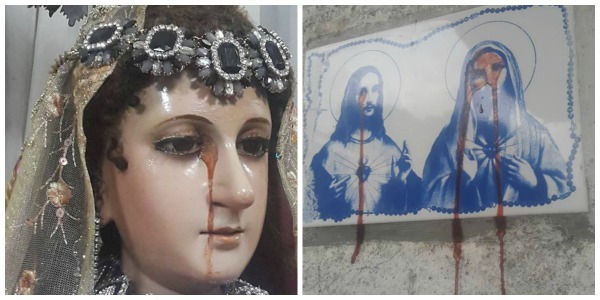 Val Sandiego,a famous art collector and choreographer who is also the custodian of a century-old of Saint Veronica, also alleged that the said statue also started weeping blood late in the afternoon. According to Sandiego, they were on their way to Dumanjug when he received a call from their maid who informed them about the strange phenomenon. Prior to the incident, Sandiego noticed that there was a scratch on the statue’s neck. "I was really thinking ngano naa may scratch sa iyang neck... There must be a message for this Good Friday. It could be that we have to reflect this Holy Week,” he told Sun Star Philippines. The statue, which belongs to Sandiego’s great great grandparents, has been in existence since the 1870s. Although Sandiego is not sure whether the phenomenon is a form of miracle, he said he is ready to follow God’s orders. The Sandiego family has already informed the parish priest of the local Saint Catherine de Alexandria church about the incident. However, the priest, who has seen the photos, has not issued any statement. Weeping statues have been reported by many Catholics in several parts of the world. Statues particularly that of Virgin Mary, allegedly weep tears of a substance that appears to be blood, oil or scented liquids. While weeping statues often attract pilgrims, many have been declared by authorities of the Catholic Church as hoaxes. Many skeptics also claimed that there are “DIY weeping statue kits” readily available in the market.